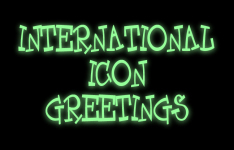 INTERNATIONAL ICON GREETINGS -- a mixture of images, a sampling of cards! Have fun wandering through my designs. If you have a suggestion for me, write and let me know -- I'll try to accommodate!